8/17/2011–Burlington, NC–North Carolina Wing, Civil Air Patrol was alerted by the Air Force Rescue Coordination Center (AFRCC) shortly after 7 a.m, August 16, 2011,. to search for a distress Emergency Locator Transmitter (ELT) in an area southeast of Burlington NC. NC CAP launched a search aircraft from Burlington-Alamance Regional Airport and dispatched two ground search teams from NC Wing Head Quarters in Burlington, shortly before 9 a.m.iimediately after takeoff the aircraft picked up the ELT signal and tracked it to an area near NC Hwy 87 South and Wildlife Club Road in Alamance County. The aircrew guided the CAP ground teams to the area. Once the ground teams confirmed they were also receiving the ELT signal, the aircraft returned to Burlington-Alamance Regional Airport. The ground teams spent several hours tracking the ELT signal and negotiating their way through the forested terrain, prior to locating the wreckage of an aircraft just before 12 noon. The ground teams quickly determined that no one was on board the aircraft and that were signs that a survivor had left the crash site on foot. The ground teams notified the Incident Commander who notified the North Carolina State Emergency Operations Center while the ground teams coordinated with Alamance County law enforcement and EMS personnel. 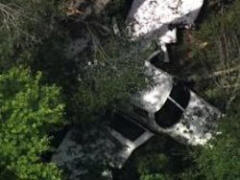 An immediate area search was conducted in an effort to locate the person who had left the crash site. The Incident Commander also notified the AFRCC of the status of the search and provided the registration number of the aircraft to the AFRCC to determine the aircraft’s owner. The Alamance County Sheriff contacted the registered owner who reported that the aircraft had been reported as stolen, having last been located at the Horace Williams Airport in Chapel Hill. Once this report was made, all CAP ground personnel returned to the Command Post and demobilized, leaving the scene to be handled by Alamance County law enforcement. All CAP personnel returned safely to the NC Wing HQ at Burlington-Alamance Regional Airport by late afternoon. The CAP Incident Commander for this mission is Lt Col David Crawford. The Ground Search Team Leaders are Major Andy Wiggs and 1st Lt Jason Bailey. The Aircrew was commanded by Capt Chuck Dawson with Dennis Bissell serving as Mission Observer.